We can create a look for any occasion – day, evening or bridal using the traditional method of make-up application. Your appointment will take approximately one hour, a trial is recommended for brides. The trial is essential as it allows us to get an idea of your requirements and determine exactly what your likes and dislikes are. Most brides like to maintain a “natural look”, and this is always our aim, yet at the same time we will enhance your best features and most importantly, listen to your own personal preferences. 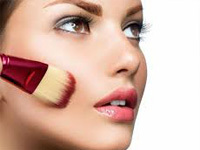 We will discuss all the points mentioned above with you and make-up will be applied to your exact requirements. All details from the trial are recorded so that we can recreate the same stunning look on your wedding day.